What is Prevalin used for? 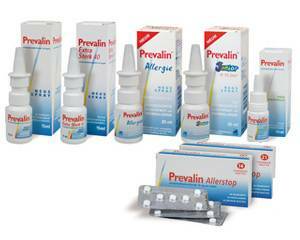 Prevalin is an anti-allergy medicine. Histamine is a substance produced by the body as part of an allergic reaction, causing typical symptoms such as sneezing, itching and swelling of the mucous membranes. Prevalin blocks the production of histamine, nipping these symptoms in the bud. Prevalin is available without a prescription. Skin rash with or without itching and papules. Prevalin is available in various forms. Prevalin Eye Drops (20 mg/ml): Cromoglicic acid-containing drops. Used for eye allergies. Prevalin Direct: Does not contain medicine but works by creating a barrier on the nasal lining to avoid contact with allergens. Consult the package leaflet for instructions on how to use your Prevalin product. Prevalin Allerstop: Adults and children aged 12 and above: one tablet, once daily. Children aged 6 to 12: half a tablet, twice daily. Prevalin Nasal Spray: Adults and children: one spray in each nostril every three to four hours. Prevalin Nasal Spray Extra Strong: Adults and children: one spray in each nostril every six to eight hours. Prevalin Eye Drops: Adults and children: one to two drops in each eye, four to six times daily. Prevalin Direct: Adults and children aged 12 and above: one to two sprays in each nostril, two to three times daily. Do not exceed the recommended dose and read the package leaflet closely before use. If in doubt, consult a doctor. Prevalin Allerstop: sleepiness, fatigue, dizziness, headache, and dry mouth, nose and throat. Prevalin Nasal Spray and Nasal Spray Extra Strong: nose irritation. Prevalin Eye Drops: eye irritation, change in taste. Consult a doctor if the side effects are severe. For more information, see the package leaflet. You suffer from severe kidney failure (Prevalin Allerstop). Consult a doctor on the use of Prevalin if you have a health condition that is not listed above or are currently on medication. If you are pregnant, planning a pregnancy or breastfeeding, you should not use Prevalin without consulting a doctor first. Prevalin Allerstop tablets may cause side effects such as sleepiness and dizziness. Do not drive or operate machinery until you know how this medicine affects you and you are sure it won't affect your performance. Avoid drinking alcohol while taking Prevalin Allerstop.